Colorado Springs, CO - The Colorado Springs Switchbacks FC defeated Harpo's FC 3-0 in a preseason friendly Wednesday night in a closed pre-season friendly. In their first pre-season match at Weidner Field, the Switchbacks took on familiar foe Harpo's FC in a closed match pre-season friendly. The Harpo's got the first opportunity early on but it was easily gobbled up. The teams battled back and forth with the Switchbacks having the majority of the quality chances. The Switchbacks finally got on the scoreboard in the 28th minute as Taylor Hunter put a bouncing ball into the net after a succession of corners. Harpo's had a few more chances but the Switchbacks backline stood strong to take the 1-0 lead into the half. "It was another good stepping stone to get ready for the season," said Taylor Hunter. "It's always great to get to play real competition outside of training, and tonight was definitely a great result." Head Coach Steve Trittschuh made a couple of changes to start the second half as Jamal Jack and Taeseong Kim entered the game for Taylor Hunter and Ayukokata Tambe. The teams battled back and forth in the midfield to start the second half but neither side really had any dangerous chances early on. The Harpo's got an opportunity in the 70th minute with a free kick just outside the box that went just wide of the post. The Switchbacks made several substitutions in the 71st minute including Shane Malcolm and Jordan Schweitzer who would go on to score. Malcolm's came first in the 77th minute after a nice individual effort saw him beat the keeper to the far left corner. Schweitzer's goal came just seven minutes later in the 84th as he blasted one over the keeper's head to give the Switchbacks their 3-0 lead that they held until the end. "It was a good game for us," said Moise Pouaty after the match. "We made a few mistakes, but this was a great game to learn against solid competition. Winning the game and shutting out the opposition gives us a lot of confidence going forward." "It was a decent exercise for us," said Head Coach Steve Trittschuh. "Harpo's always gives us a great match. I'm happy we were able to come away with no injuries, and we shut them out which is something we've been focusing a lot on lately. Overall it was a positive game for us." 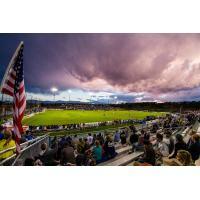 The Switchbacks will kick their 2018 USL campaign on March 17 as they host LA Galaxy II at 6:00 PM at Weidner Field for St. Paddy's day celebration with fireworks and $1 beer the first 30 minutes after gates open at 5:00 PM. Tickets start at just $12.